The oft forgotten sibling of its more famous (and photogenic) sister Devil’s Castle, East Castle is arguably Alta’s prime powder run. On Friday, I skied East Castle for the first time and experienced Alta pow on a whole other scale. East Castle is a behemoth. A vast snowfield with as much vertical as High Rustler and more vertical than Devil’s Castle that holds fresh turns for days after a storm instead of mere minutes. The price: a lot of waiting and a lot of climbing. Most years Ski Patrol doesn’t open East Castle until the snow pack stabilizes in March due to the slope’s massive avalanche potential. And when it opens, an hour-long odyssey of a sidestep stands between the pilgrim and his powder. On the ride up Supreme we were already getting giddy looking out across our destination’s expansive East-facing slope. 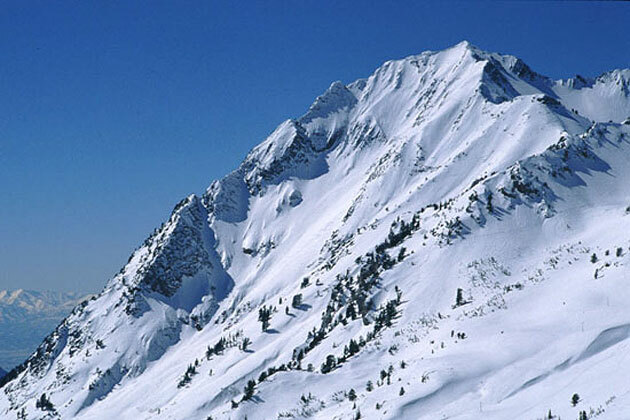 It looked to hold the best snow in Alta on account of its exposure and difficulty of access. The ropes had dropped a couple days ago but numerous untracked lines still beckoned. Ian and I (Alan), Alta Lodge employees and dedicated snow-seekers, arrived at the foot of East Castle circa 1:00PM. A dozen sidesteppers were scattered across the traverse cut into the slope side, some inching forward, some stopped and panting. Just in front of us, a couple of people stood just below the path sticking climbing skins to the bases of their touring-equipped skis. Like Ian and I, they came prepared to skin up instead of sidestep, a climbing technique less demanding of the energy we’d prefer to expend skiing down. Ian plowed ahead in his red cut-off T-shirt, arms chiseled from the season’s baggage runs; I followed slowly and steadily, my yellow Capilene base layer darkening in the usual places. Every few moments a tempting new line emerged as the ground fell away to our right. But we kept climbing. Forty minutes later we reached the summit, earning that top-of-the-world feeling with a 360 degree view of Mt. Timpanogos to the South and Mt. Superior to the Northwest. We debated two lines of descent. The first dropped directly below us, over a 10′ cliff band and down a gladed ridge with some untracked snow remaining. The second hooked a little skier’s left, down a chute boasting wind-drift pillows and only one set of tracks. At the end of the chute we would be forced to cut right, barely avoiding a 60′ vertical tumble through jagged rocks and scraggly pines. I hit the line first, ripping a couple turns in the feather-light frosting snow before launching a wind drift, snow exploding in my face a second later when I splashed down. A couple more turns, a wind drift boost and another splash down; rinse well with powder snow and repeat. Ian skied next. Details? Check out the video above. Well, I learned my lesson. 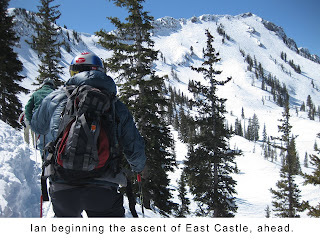 For Alta pow kept on the down low, head to the epic East Castle. Solstice Storm Cycle: 96″ and Counting!